Not to be confused with its predecessor, Lightroom Classic, Lightroom CC is Adobe’s all-new offering in the photo management space. Designed from the ground up to take advantage of cloud-based technologies, Lightroom CC is aimed at users who want to be able to access and develop their photos, in real time, across multiple connected devices. 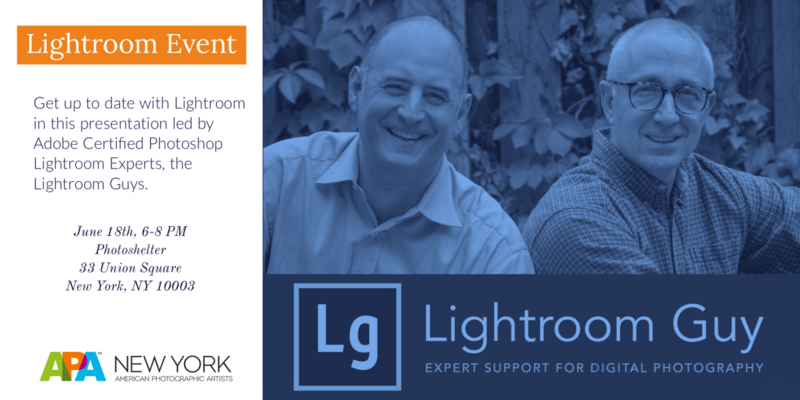 David Mark Erickson will be giving a presentation on how to understand the key differences between Lightroom CC and Lightroom Classic as well as giving a live demo, showing off the key features of the program. Since Adobe’s introduction of its newly named Lightroom Classic last October, there have been three major updates that have significantly improved Lightroom, including new and powerful developing features like color and luminance range masking. D.A. Wagner will give a live demo showing burning and dodging techniques and how to make use of these new masking options as well as the newly added Profiles (think film stock!). We will end the evening with a Q+A. The presentation will be led by APA Member (and recent “Off the Clock,” APALA winner) D.A.Wagner and his partner, David Mark Erickson. Together they are the Lightroom Guys - Adobe Certified Photoshop Lightroom Experts.